Modular teaching materials for incorporating impact investing into your course. Tactical, hands-on tools to give students real world learning from the perspective of a funder or entrepreneur. Guides for students to evaluate real or hypothetical impact enterprises in the classroom or a case competition. Social entrepreneurship and impact investing are hot topics on campuses around the world, but getting beyond the hype to core concepts and skills for students to master can be challenging. CASE Smart Impact Capital is a 9 module online curriculum covering all aspects of evaluating impact enterprises and connecting them to the right impact capital. Each of the easy-to-digest modules contain short videos to make concepts clear, tools to download and use for real-world learning, guides on the processes impact enterprises take, and links to a curated set of additional resources from the impact field. As a course instructor, you can use this faculty-developed online toolkit and teaching materials to design a lecture, group exercise, a coaching program for entrepreneurs, or a full course on social entrepreneurship or impact investing. Incorporate Smart Impact Capital into your undergraduate or graduate level course by establishing access for each of your students to purchase a license as the course “textbook.” A license provides your students semester-long access to the full toolkit, including the ability to download materials for future review. Running an accelerator program at your university? Visit our Accelerators & Funders page to understand how to use the curriculum in that context. 1: Impact Capital 101. Discover what makes impact capital different and how it changes hands in the market, from asset holders to intermediaries to impact enterprises. This is the foundational understanding of impact capital, including size and scope of the impact investing marketplace. 2: Articulating Strategy to Investors. What’s the venture’s strategy for growth and impact? Learn how to assess an impact enterprise’s growth across 7 dimensions and download a reusable tool to evaluate real or hypothetical organizations. Also contains tools to understand how enterprises evaluate impact and explore standard ways to communicate to investors with different impact evidence preferences. 3: Calculating Your Funding Gap. Learn entrepreneurial finance in four short videos – this CFO-built module helps students master the key elements of an investor-friendly financial projection model. Contains excel-based templates and step-by-step instructions so students can practice building a working financial model from scratch. Students can also start with a sample model for an impact business and explore how changes in inputs like costs, price, and units sold impact the company’s bottom line AND the funding gap over a period of years. 4: Types of Capital. The impact capital market includes grants, debt, and equity, as well as a number of alternative finance vehicles specially designed to meet the needs of impact enterprises, including pay for success, variable repayment debt, and crowdfunding. Our short, easy-to-digest primers on 13 types of capital and our decision tool help students evaluate which vehicles are most aligned with a venture’s needs. 5: Investor Triage. What’s the difference between a CDFI, a foundation, a fund, a family office, and an INGO? We provide a guide on 11 types of impact investors, including their common financial and impact motivations and the types of vehicles they tend to use. 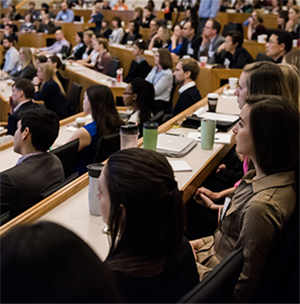 Students learn best practices on how to evaluate what investors may be a good fit for the specific needs of an impact enterprise based on knockout and fit criteria. 6: Scenario Planning. Building on the excel-based financial model from Calculating You Funding Gap, students understand how to pressure test an actual investment offer, seeing how different investment terms impact the bottom line and funding gap of an enterprise. Guides on scenario planning and sensitivity testing allow students to put themselves in the position of an entrepreneur who needs to negotiate for deal terms that truly meet their needs. 7: Investor Outreach. Impact enterprises have to tell a coherent story that combines their growth and impact goals. Four distinct types of investment stories – such as high growth vs. delivering impact at scale – form the basis for learning about how entrepreneurs can best communicate to investors. Students can use templates to craft their own executive summary, short pitch deck, and longer business deck, or evaluate the documents of others. 8: Investor Cultivation. What do the interactions between investors and impact entrepreneurs look like? We provide tools and guides for the frequently long process of cultivating a funder to the point of ultimate investment. Students understand and calculate the “back-pocket” metrics every entrepreneur should have on hand, learn how to interpret what investors are saying, and review tools to keep potential investors engaged in the enterprise. 9: Due Diligence and Beyond. The due diligence process between investor and enterprise can be long and involve a lot of back-and-forth. Students have access to the real due diligence checklists used by a host of impact investors currently working in the field. Real-world term sheets for different investment vehicles provide examples students can practice deciphering, and a guide to terms makes that process easier. Click the button to download our Academic Guide for more detail on what’s in each module and ideas for how you can incorporate pieces of the curriculum or the full course into your classroom. If you have more than 20 students license the toolkit for your course, you’ll receive additional plug-and-play classroom materials to make incorporating content easy. Want to review the full curriculum yourself first? Email CASEsmartimpact@duke.edu to request a review license. We’ll allow you a few weeks to explore the modules so you can plan how you’ll incorporate the toolkit into your course. The price for a classroom license is $100 per student. Classroom licenses are active for 4 months, and many of the tools and resources in the modules can be downloaded by your students for future review – just like a textbook. In addition, for classes with more than 20 students purchasing the toolkit, the instructor will receive a set of teaching resources to jump start planning, including lecture slides, classroom activities, and exercises. 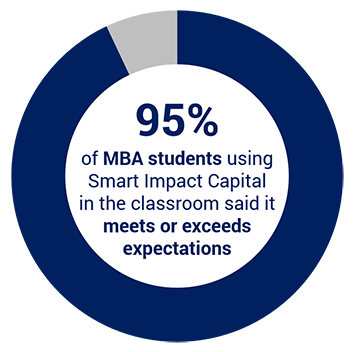 Email CASEsmartimpact@duke.edu to begin providing Smart Impact Capital to your students, or to request a temporary review license so you can preview the materials yourself. See Terms and Conditions of use here.